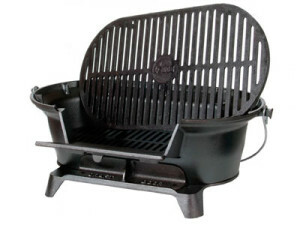 Lodge L410 Pre-Seasoned Sportsman’s Charcoal Grill is portable, safe to use and comes with features that give the users a variety in what they use it for, cooking, frying or grilling or what types of food users can use it with. The grating measures a decent 19 by 10-1/4 by 8-1/4-inch and is made of cast iron. It comes with a limited lifetime warranty. The Charcoal grill is compact and not overly heavy. It is small enough to fit in your car for tailgating and camping trips, in your attic, or even in your porch. It won’t use up much space and it’s rather easy to carry it around. The grill is highly user friendly. Easy to set it up without any hassles and clean up when you are done using it. The regulation methods are pretty straight forward, so you don’t mess up with your cooking. The grill is large enough to cook enough food for two to three people at the same time and has heat retention because of the cast iron. It keeps the flavors of the food for better tasting grilled foods. Cleaning the ash out of the fire bowl to avoid any moisture, may require some efforts to do and be somewhat cumbersome. As it comes without any lid, it can’t be used for grilling using smoke at lower temperatures, leading to ineffectiveness in cooking a larger cut. The cast iron may take long to heat up and later, to cool down before you clean it up. As the grill is close to the ground and can get quite hot, it may leave burns on the surfaces you place it on. This charcoal grill is highly recommended for those who like to take their grills on camping trips or whatever event they go to, and prefer functionality and good quality. The drawback of overheating the surfaces can be avoided with a few extra safety steps. The grill is sure to provide you with quality food and a good grilling experience. Measures 19 by 10-1/4 by 8-1/4-inch; limited lifetime warranty.